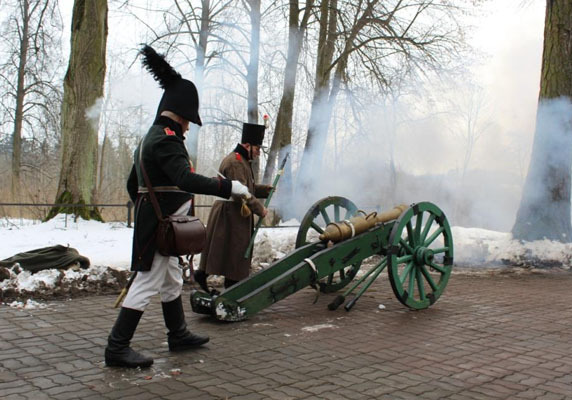 On February 7, in Bagrationovsk, solemn events dedicated to the 212th anniversary of the Battle of Preussis-Eylau (the historical name of the city) were held. This battle of the era of the Napoleonic wars is comparable in scale to the Battle of Borodino, and in France it is even more famous. Then, in 1807, Russian troops, reinforced by Prussian units, successfully opposed the French army. This was the first time when Napoleon personally commanded the troops could not win. Bagration, Barclay de Tolly, Bennigsen, Murat, Davout, Marshal Ney — the names of famous commanders who took part in the battle personify for us the history of the Patriotic War of 1812. Those who gathered on February 7 at the Glory monument of Russian weapons honored the memory of the fallen soldiers (there were 50,000 people on both sides killed and wounded in the Battle of Preussish-Eylau). The event was addressed by the Deputy Presidential Plenipotentiary in the North-West Federal District Roman Balashov, owner of the Infamed K company - Ekobaltik resident Andrei Gorokhov, military attache of the French ground forces in Russia Pierre-Marie Liegen, founder of the reconstruction movement in Russia Oleg Sokolov, Andrei Yermak, Minister of Culture and Tourism of the Oblast Government, and others. During the solemn ceremony, the Baltic Fleet military band played, salute was made from the artillery of the XIX century. Also these days in Bagrationovsk the first stage of filming a historical film, the author of which will be the famous Russian documentary director Alexei Denisov, took place. The scope of what is happening is not accidental. All events in one way or another are taking place in the context of a large idea that can transform the image of Bagrationovsk and enhance its cultural and historical value. Andrey Gorokhov and his supporters told about some details on February 7 during a round table. In particular, in the framework of the cultural-historical project related to the Battle of Preußisch Eylau, documentation is being developed on the reconstruction of the 14th-century church, with which Napoleon observed the progress of the battle. The building should house the Battle of Preußisch Eylau Museum. According to the concept of the future project, it should become a venue for concerts and exhibitions, that is, become a full-fledged cultural center. In addition, the issue of installing monuments to Russian and French troops at key points of the Preußisch Eylau battle is being discussed; about the reconstruction of the house where Napoleon stayed. Possible implementation of other projects. - Considering the improvement of the city park under the program “Comfortable urban environment”, in the future a full-fledged cultural, historical and tourist complex should emerge. Of course, the project is complicated and long, but if implemented, it will give impetus to the development of the entire urban infrastructure, - says Andrey Gorokhov, Advisor to the Governor of the Kaliningrad Region, owner of Infamed K LLC. - In the summer, a simplified visa regime will be introduced in the region, which will make it easier for Bagrationovsk to connect to European tourist routes. From an economic point of view, the benefits for Ekobaltika will be undoubted. Industrial Park specializes in high-tech industries, where qualified specialists work with their own requirements for the quality of life and leisure. In addition to the economic benefits, for our residents are important such things as the "prestige of the place", urban improvement, the quality of the infrastructure. Transformed into a tourist center, Bagrationovsk will provide all this to a high standard.